Yeah, that’s a good word for it. Or we could say it was a “hot mess”! I showed you how it usually looks: with empty dishes, spills, and crumbs, with a lackluster sofa photo-bombing in the background (ugh…don’t judge). 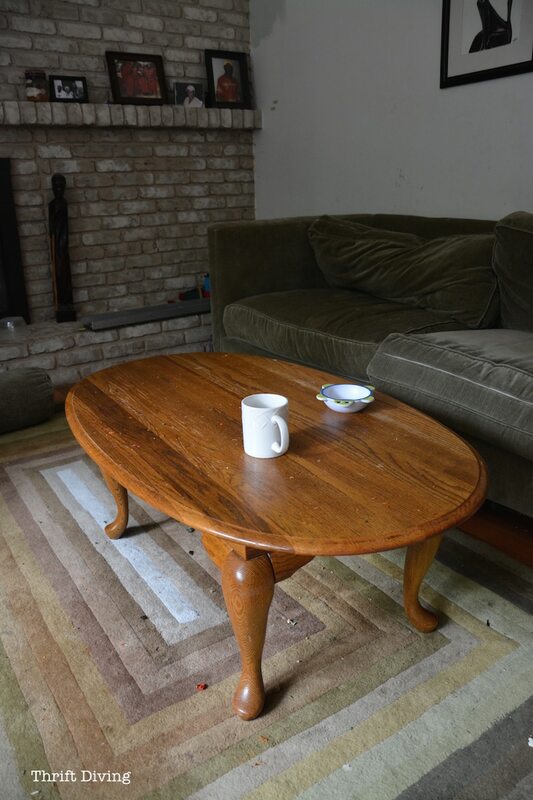 I had found it a this coffee table a couple years ago from a thrift store for only $5.00! It wasn’t necessarily my “style” but for $5.00, how could I pass that up?? It served its purpose: feet, cups, remotes, morning cereal, and evening dinners in front of the TV with my family gathered around it. Now that I’m finishing up my family room for my 30-Day September Makeover (stay tuned–all of the room makeover “AFTERS” are coming! 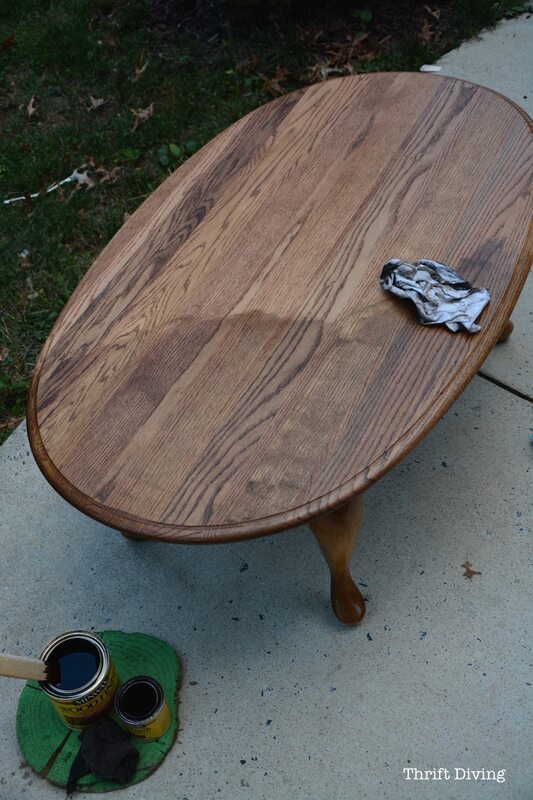 ), I wanted to give this coffee table a little “clean up” with some new stain and painted legs. All of the varnish on top started to chip, and I was never a fan of the color of the wood, anyhow. But after making it over this past weekend, this is how it looks now! 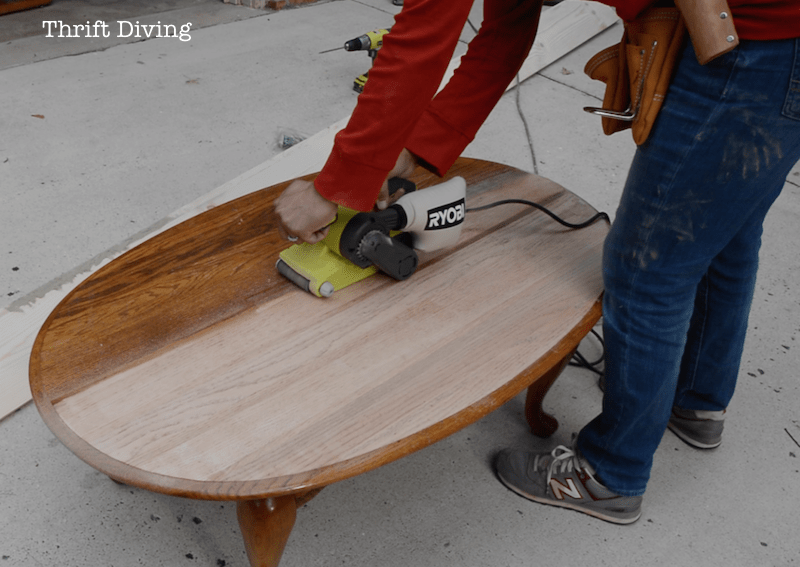 One of my awesome readers emailed me about another project I did and pointed out that I really shouldn’t be using an orbital sander to sand my projects because it’ll leave the swirly marks. And even though I saw those marks and knew that, they were never so noticeable that it ruined my projects. You really should use a belt sander when stripping a top like this, going in the direction of the wood. So I took her advice to heart, asked RYOBI (with whom I partner) to send me one of their awesome belt sanders (they’re really affordable at $50), and got to work. This was actually my first time using a belt sander simply because I had never owned one. It’s one of those tools that is easy to use, but you must hold on tight, because that baby grips the wood so closely that it feels like it wants to get away from you. Just hold on tight, and keep passing it over the wood to strip off the wood. I don’t recall the grit of sandpaper I used, but it was a medium grit. And we sure do your final sanding with fine sand paper so that it smooths out any roughness left by the medium grit sandpaper. I did this step by hand with 220 grit fine sandpaper (not pictured). The wood was gorgeous when I was done! And this is another area that I need to brush up on: learning to identify different types of wood. I have no idea what this is–oak, maybe? Does anyone know? How do you tell the difference? What are the characteristics between different types of wood? I’m an idiot when it comes to that. I wanted a darker top and white legs. I chose Minwax Early American for the base stain, and planned to layer it with a darker stain on top. So I kept layering coat after coat of darker stain until I got the shade closer to where I wanted it to be. I believe I used Minwax Jacobean color on top of the Early American color. I’m sure I was doing it all wrong. I know I was probably supposed to lightly sand in between. The result was really pretty! It looks really dark in this picture, but I had sanded it lightly, and put a few coats of Miss Mustard Seed furniture wax on top (which I really love because it smells much better than the Annie Sloan clear wax!!). 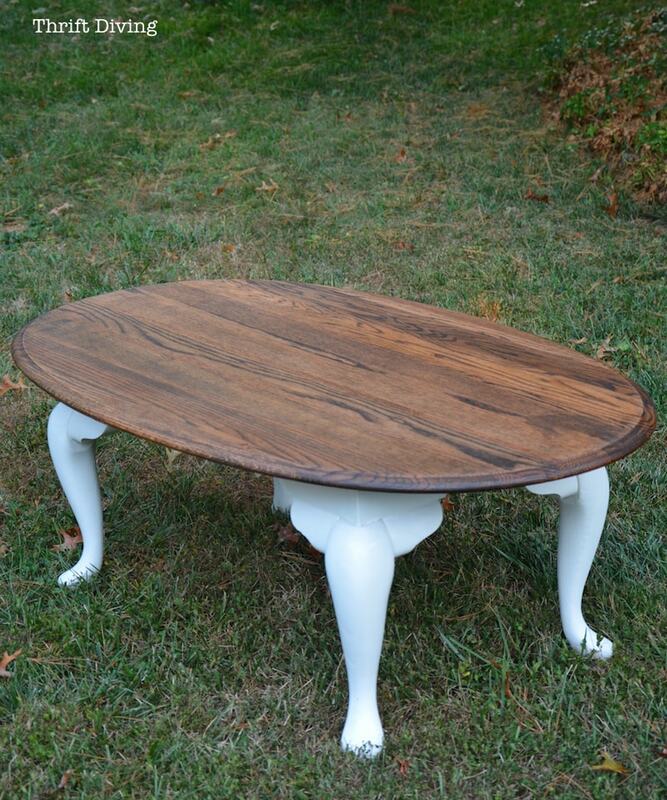 And I painted the legs with Annie Sloan Pure White chalk paint. I tried to mix in some CoCo chalk paint so it wasn’t so “white” but it still came out pretty white. But I think I like it this way, anyhow. I did, however, end up with a big ‘ole black mark on top. I couldn’t figure out what went wrong in my sanding. See it there on this end? I’m half afraid to attempt to sand that section out and re-stain it. So I’ll be leaving it there. 🙂 I’ll just make like it was purely intentional. Oooh….yeaaaahhh…..all planned, baby! 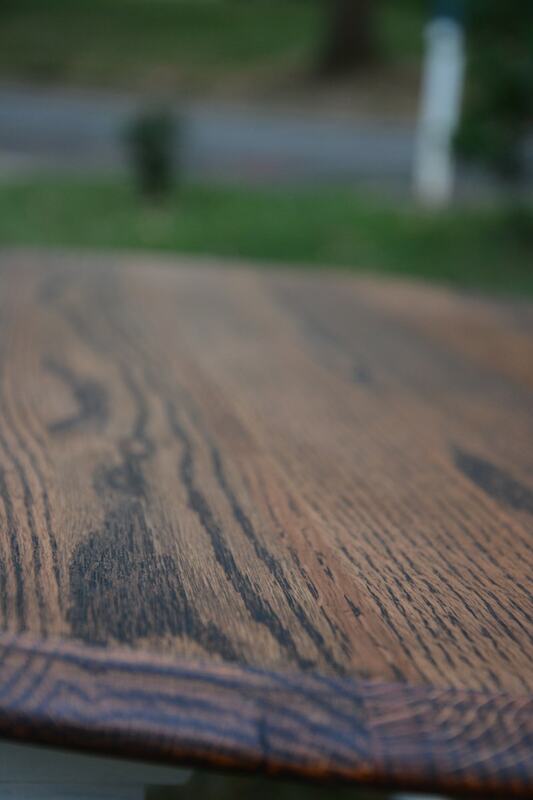 The grain of the wood looks awesome! I’ve really been loving the look of wood lately. I still say it’s okay to paint wood if you want to! No harm in that! 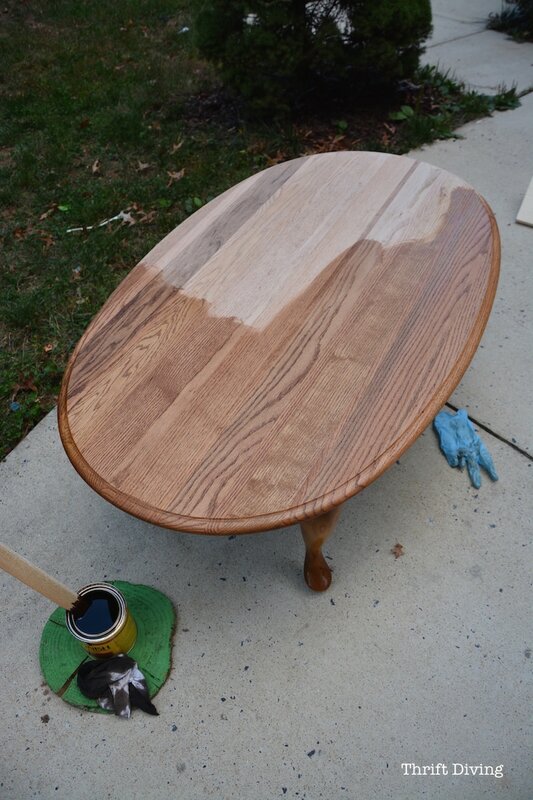 But the look of fresh stain is so refreshing to see, too! Later this month I’m planning to build my very own coffee table with built-in storage. Woo hoo! 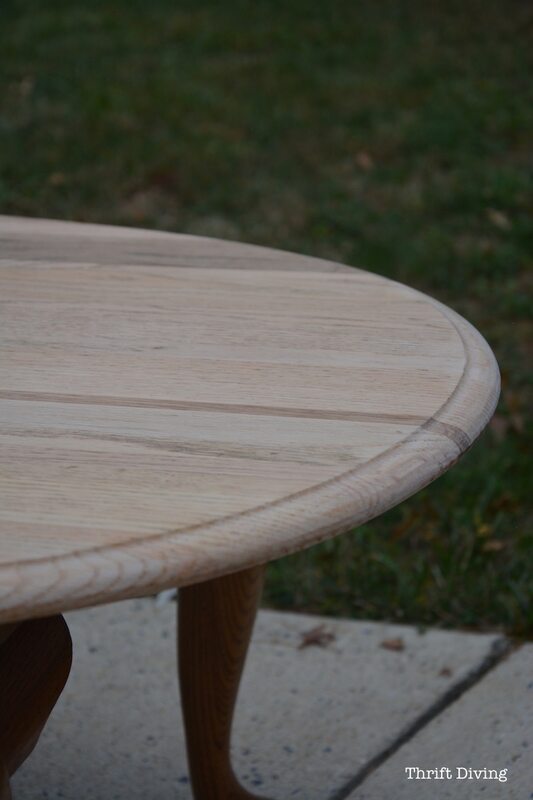 So this coffee table will probably go in my basement that I made over earlier this year. The paint was literally still WET when I took these pictures, too! I was heading out on a flight early the next morning and wanted to show you this project while I was gone. Thus, the wet paint you see here! HA! I hadn’t even sanded or waxed the legs yet. Now that’s gangsta-style blogging! LOL. I’ll put the finishing touches when I get home. 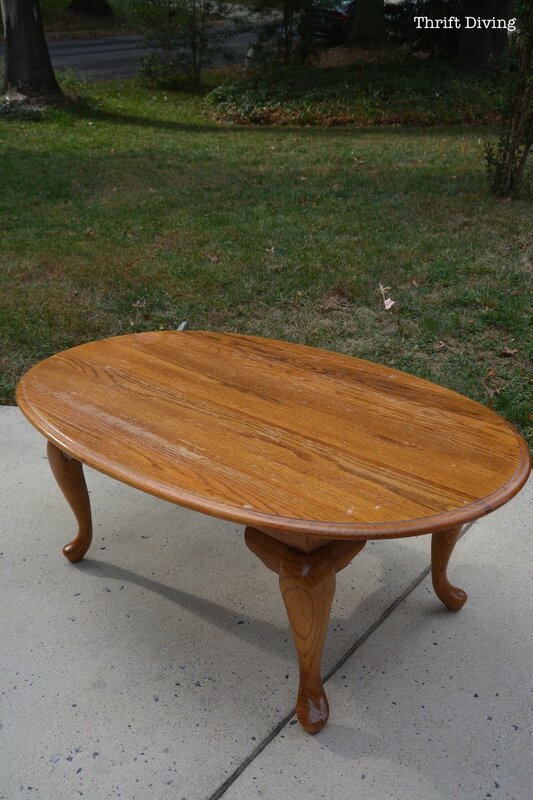 So here’s another look at my chipped $5.00 coffee table from the thrift store. Yes, it’s mismatched from my very modern sofa, but you know what?? It’s furniture. No one is going to stone me for having an eclectic house! (Do you gush about your cheap furniture, too, when guests come over?! I can’t help myself!!). 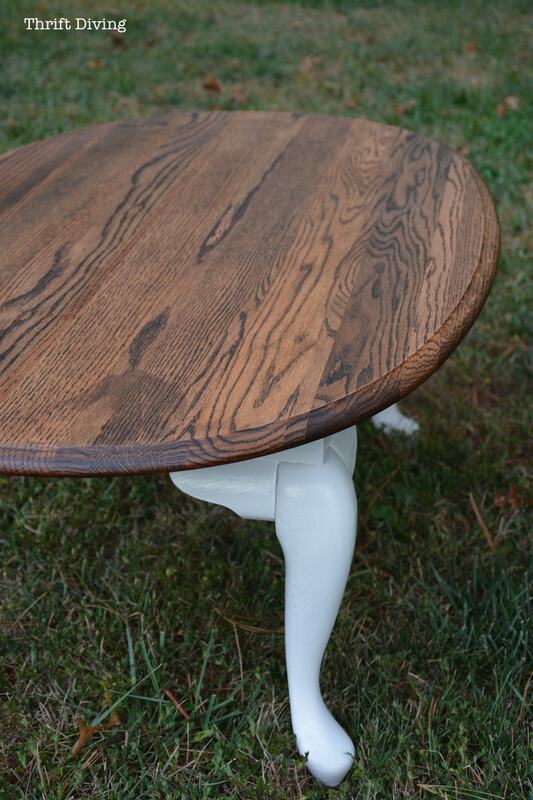 So have you ever made over a piece of furniture and ran into unexpected outcomes and decided to just “roll with it,” too? Leave a comment and let’s chat about it! I found your blog for the first time, today. It is incredible. I read all the comments, I know they are encouraging to you. Mintchip and Katherine both said the wood is oak, which it is. 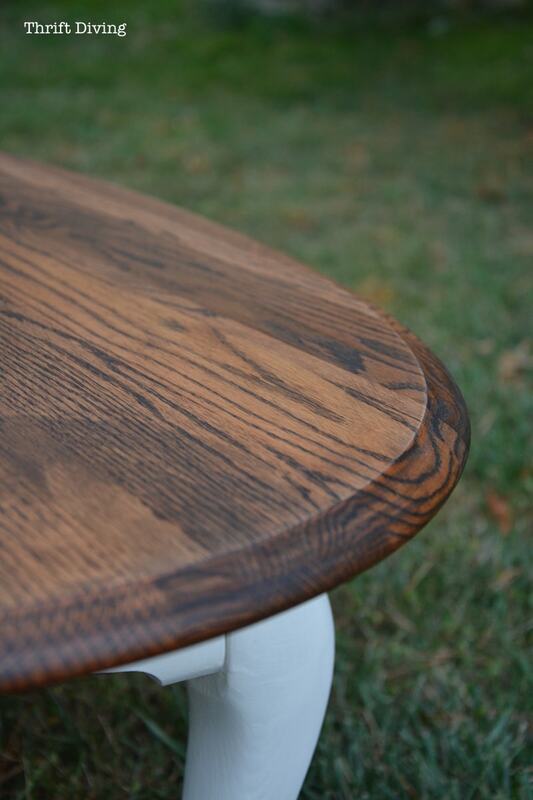 If you notice oak is a very hard, heavy, solid wood, you have to try really hard to make a dent in it. 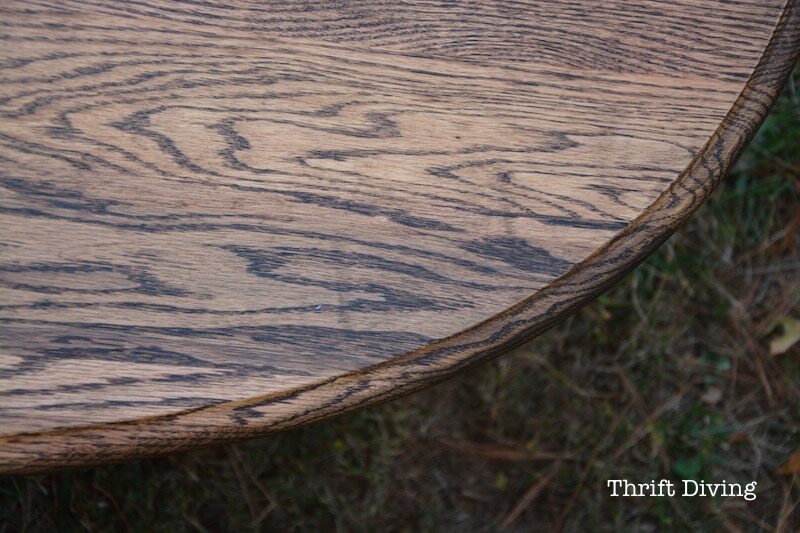 The grain is a large grain, but the stripey looking layers of the wood are kind of tight together, whereas pine is a wider grain, and the wood is much softer, so you easily put dents into it if you aren’t careful. 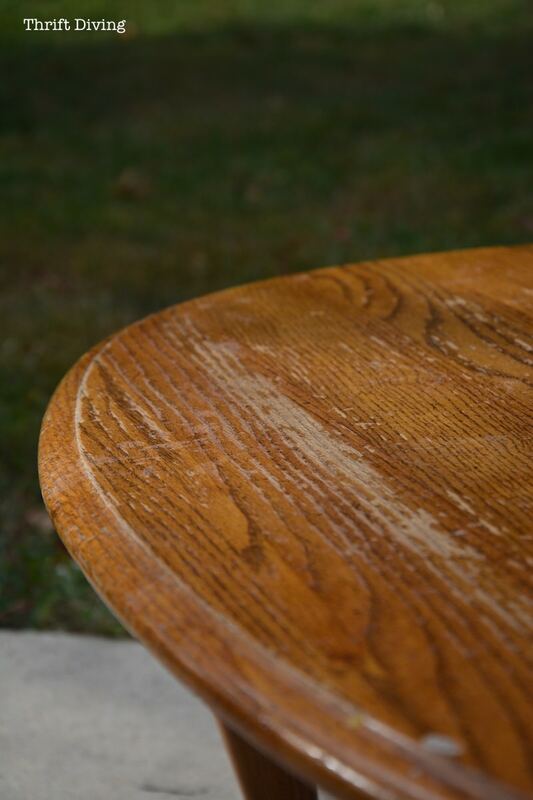 The dark spot you are seeing, could be a stain on it, but chances are it is related to something that happened to the wood when it was growing, and isn’t something you did. I just want to say I really love all your work, I also do a lot of dumpster diving and thrift store makeovers. I have done so all my life out of necessity. My daughters always wanted new when they were growing up, but now I notice they head to the thrift stores and are picking things up off the side of the road, after being embarrassed about me doing that all their lives! You are showing your children a valuable lesson. A beautiful house doesn’t have to cost a fortune. Keep up the good ideas, you are very creative, I am truly enjoying your blog! Thanks for sharing. Hi Serena! First time leaving a comment; but I love your projects! 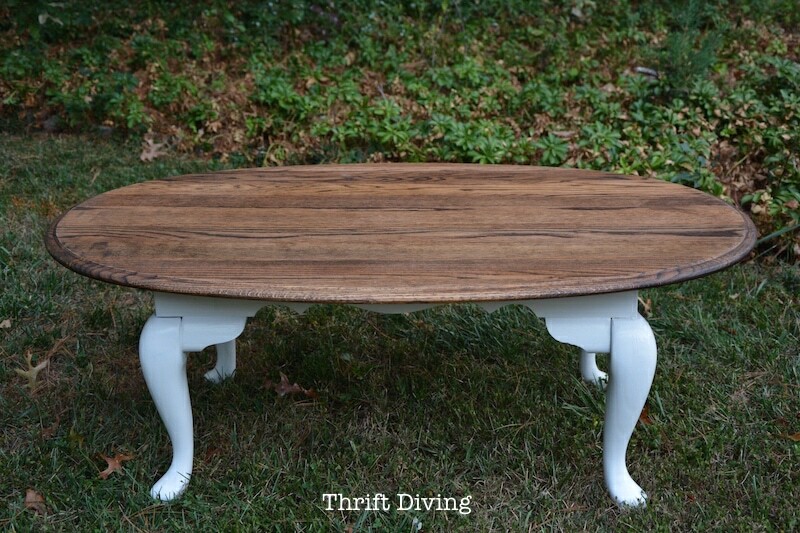 I’m curious, I’m thinking about doing something similar to my beat up table that has had its fill of carved in homework assignments and paint from art work. I’ve read some posts where they tell you to remove the stain from the legs too before painting…do you think this is necessary for painting with the same chalk paint you use? I know I should test it, but I’d love to be lazy and skip sanding legs which seems so time intensive! Glad you commented! 🙂 Nope, you don’t have to sand those legs. No way! Legs are way complicated (as I learned in my last chair project and trying to sand legs. LOL). 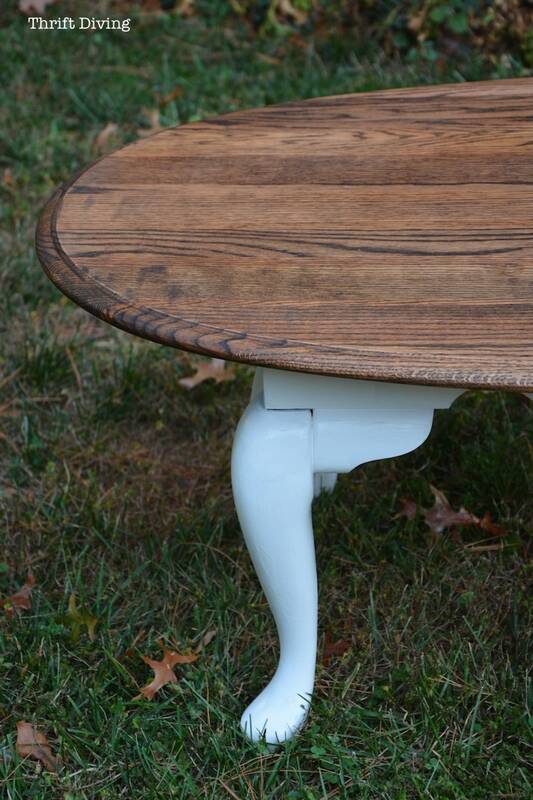 With chalk paint and most furniture paint, you never have to sand. 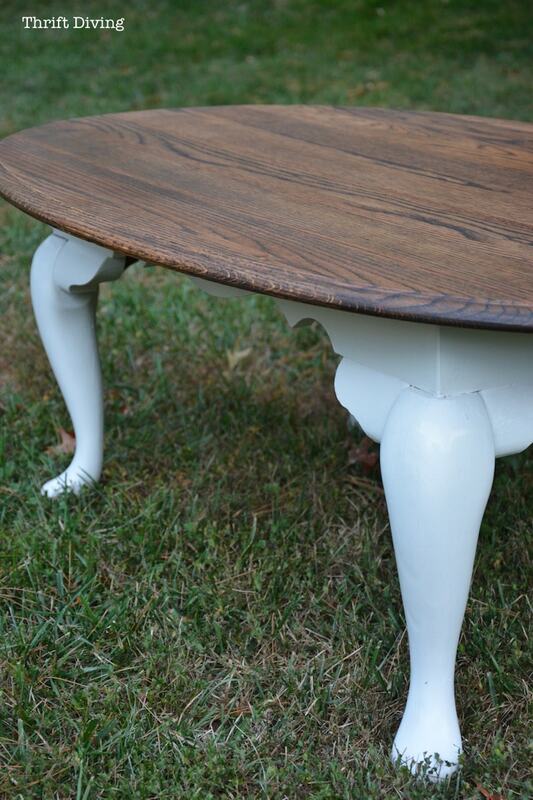 ONLY if the legs were beat up and you needed to add wood filler or something else to fix it first. Then you’d only sand that spot. But sanding in general is only for surfaces that are in bad shape where you had to fill it with wood filler and then sanding smooth for gouges and other surface imperfections, or if the top has stuff like stickers residue (from kids, LOL), bumps, and other things that would make the surface not a good surface for painting. Does that make sense? Let me know if you have any questions!! When I was a kid, there was a girl in my class named Serena. I always answered to her name haha! You have saved me so much trouble hehe…thanks for sharing your experiences on that! 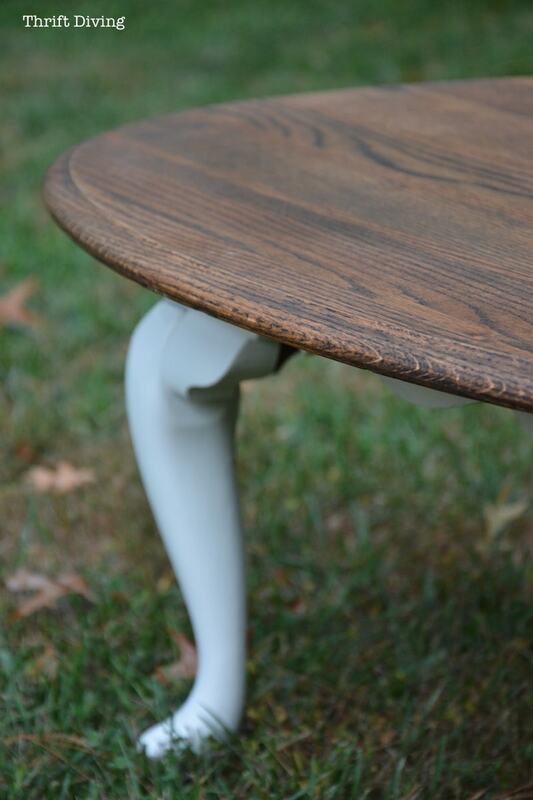 I’ll definitely just paint the legs then…I love the wood+paint combo you do for your pieces. Can’t wait to try it out! I’ve owned orbital and belt sanders. I’ve used a simple belt sander. I’ve learned that like painting a room, set-up, technique and tools help me create satisfying products. First, I take my time to get it right. I don’t rush the early stages of sanding a project. Second, I use the correct grit at each stage and I switch to new sandpaper often. It saves time and improves the look and quality of work. Third, my technique has improved over the years by practicing. Lastly, like you, though I purchase most of furniture from thriftstores or Craigslist, I don’t buy CRAP. 9 of of 10 visits I don’t buy anything. But, occasionally I’ll find a hidden gem which makes the hunt soooooo fun. Hi Serena, Thanks for the compliment. Fortunately for me I found this hidden gem in a huge dumpster outside of one of my previous apartments. The dumpster is so expansive, I climbed into it. My love of all things industrial (metal, pipes and steel) peaked my interest. Additionally, I enjoy infusing my interior spaces with industrial trays, tables and as you know lockers. The beauty of this find is that it’s an original Berger locker, Yes, the company that made the lockers you had in school. The beauty of what we do is that we see the potential beauty in items (and people) when others simply see TRASH! Keep up the great work Serena. We’re proud of you!!!!! That locker, though….I just got back from Minnesota and there was an amazing set of lockers there for muuuuuuch more than “free”!!! LOL. I’ll post about it this week! I’ve a confession. I do not noticed stuff like your dark glob. 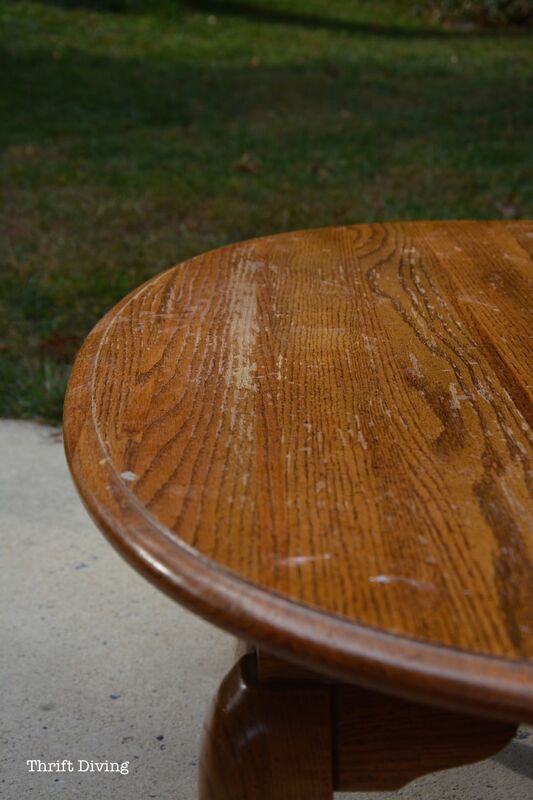 No longer does my brain register that so I thought the table gorgeously flawless. THEN you have to–just have to let us know of a stain darkened area. And what do I do???? I begin making a picture out of the image. What’s there???!!! ?A skinny head and thick body!!! The arm is curved ( right one) and now when I make it in time to ever visit I’ll find pictures all over the piece??!!!!! LOL, Gwen, you forgot to name him!!! 😉 Maybe Fred?? Yes. I think I like Fred. Or Gerald. Hi Serena, I have just one question. 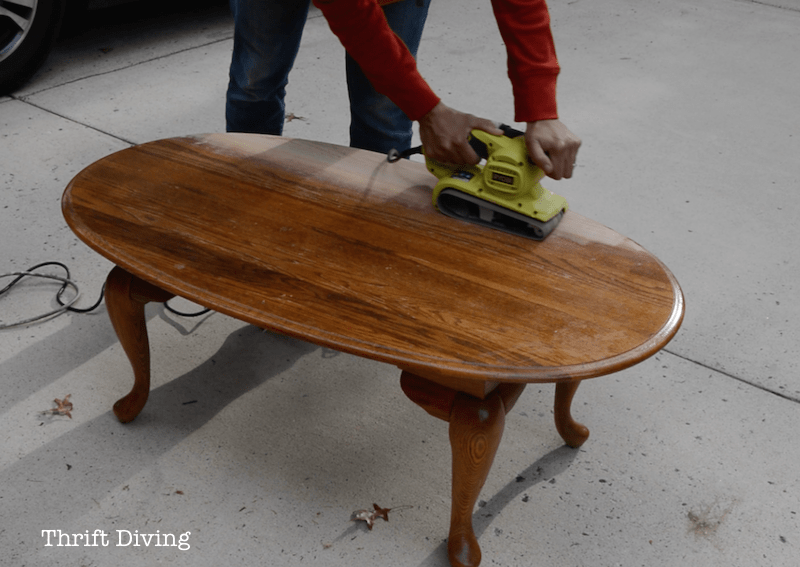 What did you use to sand the edges on the table top? I can only think of sanding by hand? Thanks so much and love your blog! Sorry, I forgot to mention! I did film some video, but haven’t had time to upload it yet. I used the RYOBI JobPlus multitool. It has a little triangular head and it was perfect for that little odd-shaped edge! 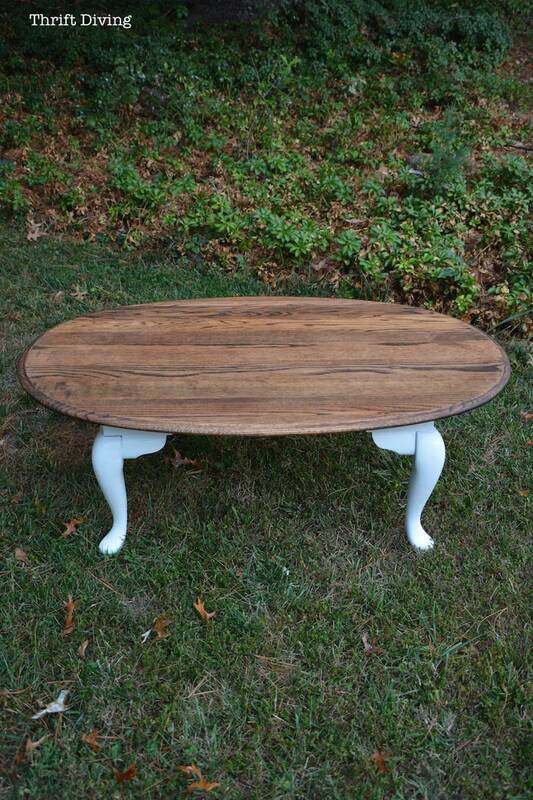 Wow the table looks entirely different ! Great job ! Once again, a gorgeous piece !! You did a terrific job. 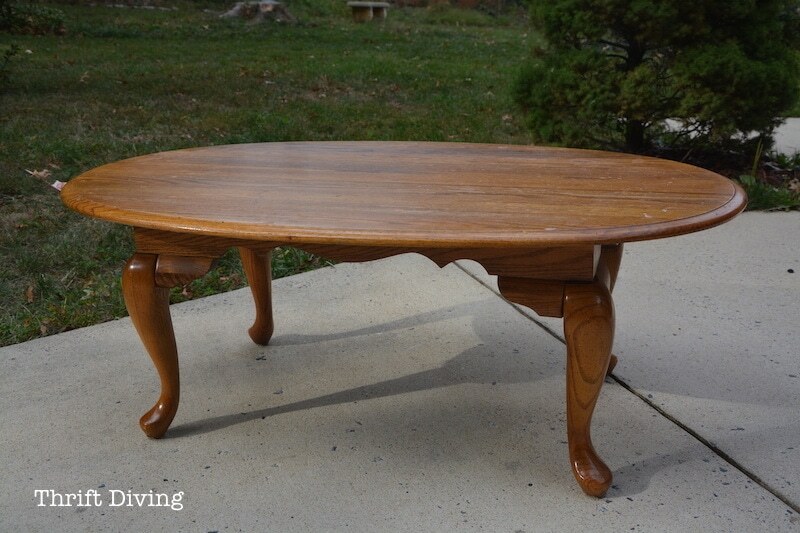 I have an old dining table (one of those with a claw on a ball). 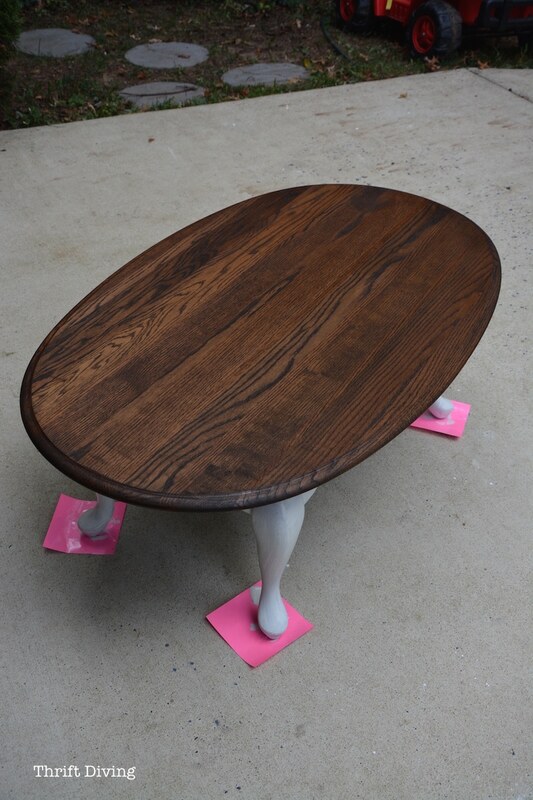 What you did with your table will look great on it. Thanks for the inspiration.